Turn out perfectly baked madeleines with this classic, traditional French pan. 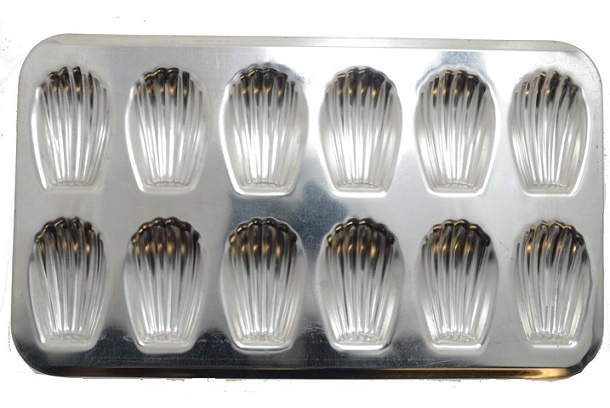 Designed for superb heat distribution, this pan ensure these delicate little cakes bake evenly and gently. This regular mold turns out twelve 8cm long shell-shaped cakes or biscuits. Heavy-gauge tinned steel ensures even and gentle heat distribution for consistent baking and professional-quality results. Use only wood, nylon, silicone or other nonmetallic utensils to avoid scratching the surface. Hand-wash in warm, soapy water. Dry thoroughly before storing. Do not use abrasive cleaners such as metal scouring pads, as they can damage the surface. NB: When new the tin is shiny. However, it will become darker with baking. This is normal and will not interfere with the properties of the metal.